After foraying into events with a sub-site Zomato.com/Events earlier this year, Gurgaon based Zomato (formerly Foodiebay) has now started offering online ticket booking for its events section. As of now, the site is offering over 1,75,000 tickets for New Year's Eve (NYE) parties, translating to ticket inventory worth over Rs 40 crore. The company will not take a 'convenience charge' from its customers but will make it up with a cut from the price being charged from the consumers, like other competing sites (last we checked bookmyshow.com also does not charge a separate convenience charge as it does for booking movie tickets). Although Zomato did not disclose the exact percentage of the cut it would pocket, in general, booking sites charge merchants 5 to 10 per cent of the revenue if they take a convenience charge from customers. If the convenience charge is not levied, the percentage increases and can go up to 15 to 20 per cent. So our back of the envelope calculations shows Zomato could end up making up to Rs 8 crore from this initiative, assuming of course, it sells all of the tickets. Tickets will be available for more than 30 venues in four cities that include Delhi, Mumbai, Bangalore and Pune. The company claims that this is the first time NYE ticketing will be done on such a large scale by any portal in India. Although BookMyShow covers more cities, Zomato definitely offers more options in the 4 cities it covers. Deepinder Goyal, co-founder and CEO of Zomato.com had earlier indicated that the company will aggressively focus on its events section and the ticket booking facility could be a result of that. As of now, only the top metros have been targeted by the company, but Goyal adds that the events section will reach out to more cities in the future. 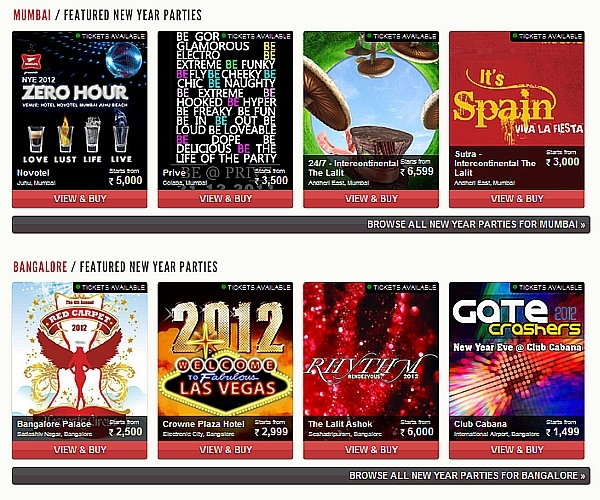 "This is our first move into the online ticketing space and we are starting it off with New Year's Eve parties. I'm confident that this move will be very well received like all our offerings have been so far," said Goyal. The company claims to have over 2 million visitors every month (through its restaurant guide) across 10 cities in India including Delhi NCR, Mumbai, Bangalore, Chennai, Hyderabad, Pune, Kolkata, Ahmedabad, Jaipur and Chandigarh and it plans to cross-sell tickets to its own audience to keep customer acquisition costs low. The company currently employs 100 people across 10 cities in India. It had earlier raised its second round of investment of Rs 13.5 crore from Info Edge, who had first invested in Zomato in August 2010. According to Goyal, the start-up is also working with partners to run table reservations and online orders. According to the company, today is the first day of their ticketing section and they have already witnessed a 40 per cent rise in the daily visitors to the main site (around 65,000 visitors hit Zomato.com last week on the same day) and a 25 percent crossover rate from the existing Zomato sections to the New Year Eve's section. This monetization plan comes as a natural extension of Zomato's event section. Although this is a good initiative it is now pitted against the likes of Buzzintown, DoAttend, BookMyShow and Ayojak, among others. But for an entrant into a segment, we would have expected the firm to come up with a customer grabbing hook with special offers like 'early bird discounts' like for example the first 100 people to buy the tickets will get them at a 10 per cent discount.